Today, there are over 60 million mobile cellular subscriptions in Africa – an astounding increase from less than 5 million ten years ago. Unlike anywhere else, mobile phone subscriptions quickly leapfrogged over fixed landline subscriptions, some calling it “The Death of the Fixed Line.” Similarly, mobile broadband is experiencing a much faster uptake than fixed broadband. 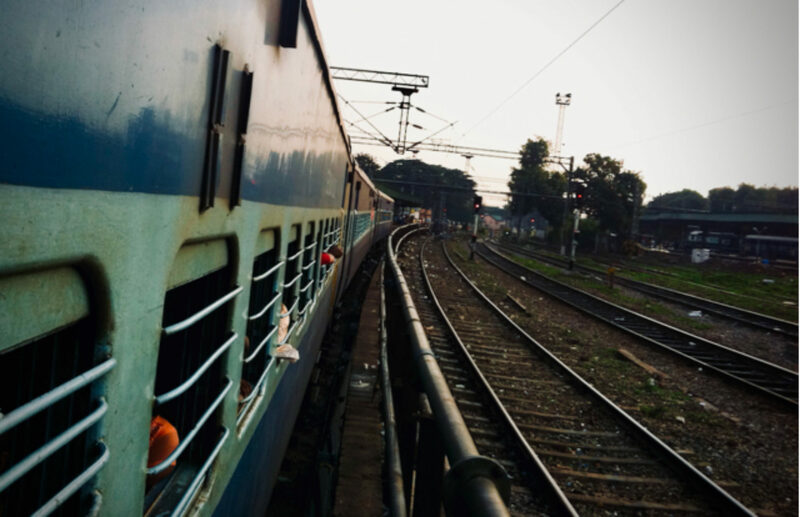 In this post, we discuss the policy, infrastructure, and accessibility considerations that have allowed mobile to be successful in telephony and will do the same in broadband access. Out of the world’s population of nearly 7 billion, only 32% (2.3 billion) are Internet users today (ITU, 2011). In Africa, Internet penetration is even lower: out of the 1 billion Africans, only 13% (1.4 million) use the Internet (ITU, 2011). This is what’s called the digital divide, where poorer regions are less likely to have access to ICTs. There are signs that the digital divide is slowly closing. 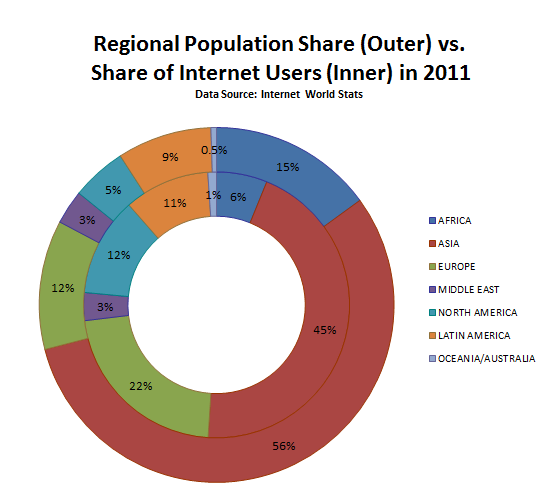 In 2000, Africa was home to 13% of the world’s population but less than 1% of the world’s Internet users. After eleven years, Africa’s population has grown to 15% of the world’s population, and so has its share of Internet users, up to 6%. This is progress, but there is still a long way to go to close the digital divide. 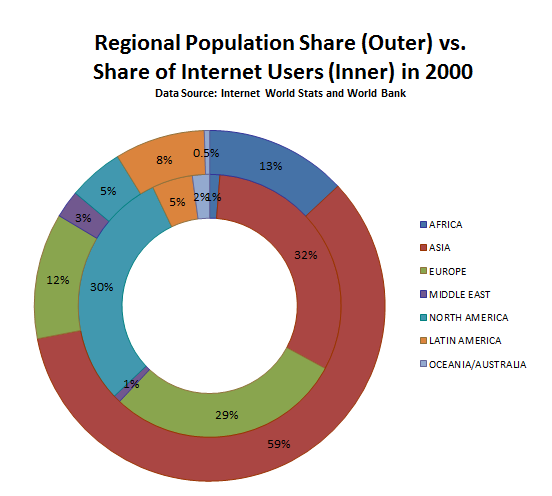 Although a proxy, equal distribution of Internet users related to population share would demonstrate progress in closing the gap of global inequity. Statistics show that mobile is narrowing the digital divide. Access to mobile services has leapfrogged traditional fixed-line methods of communication in the last decade. Over 60% of people in Africa use mobile phones, while stagnant fixed telephone lines have remained relatively flat over the last ten years. It’s likely that broadband services could go the same way. Already, the growth rates of mobile broadband adoption (54% compounded annual growth since 2006) are much faster than fixed broadband adoption (11% compounded annual growth since 2006). There are three key areas that point to the potential for a speedy uptake of mobile broadband services: infrastructure, policy, and accessibility. 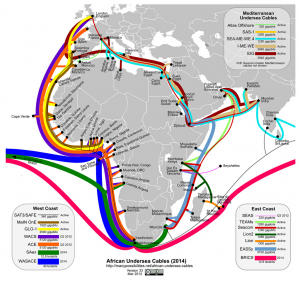 As of 2000, there were virtually no undersea cables for broadband services surrounding the African continent. In the last five years, several large undersea cable projects brought broadband services to Africa for the first time. In the late 2000s, several new undersea fiber optic cables were installed on the east and west coasts of Africa, including EASSy, SEACOM, TEAMs, WACS, Glo 1, and LION. An expected $2.8 billion will go towards these cables between 2010 and 2012 (Phillip, Lyons, Page, Viviez, Molina, & Ensor, 2011). This presentation by Steve Song shows how broadband capacity has dramatically increased over time, along with several infrastructure projects that will be completed in the near term. The increased broadband capacity around Africa enabled the rollout of 3G services for mobile broadband. 3G services were first introduced in South Africa in 2004, and took off in 2007 when Safaricom introduced the service in Kenya. Since its introduction in Africa, 3G “has provided a viable alternative to fixed broadband, in the form of Internet enabled handsets and wireless modems/dongles,” (Phillip, Lyons, Page, Viviez, Molina, & Ensor, 2011). The increased broadband capacity combined with privatized markets, falling prices, and accessible hardware sets the stage for the continued increase of mobile broadband. Historically, fixed line service providers have been state-owned. In a market with no competition, a state-owned telecom can charge any price for its services. High prices in a monopolized markets across Africa stifled both the innovation and adoption of fixed services, whether telephony, dial up Internet, or broadband. When there is only one player in the market, there is no incentive to expand coverage or services. State-owned telecoms presented a closed loop of stagnated growth. Today, the market has liberalized; mobile network operators are rarely state-owned and have consistently operated in the private market since their introduction to Africa. Private mobile network operators like Vodafone, MTN, Airtel, and Tigo work in a highly competitive market which drives down prices, as we’ll discuss below. The competition in the market encourages telecoms to expand their services geographically to reach more of the population and enter new markets (Phillip, Lyons, Page, Viviez, Molina, & Ensor, 2011) and invest heavily in infrastructure. Moving forward, the GSMA, the ITU, and other mobile services organizations are pushing for policy that allows for expansion of the digital spectrum to ensure that mobile broadband services can reach rural areas. . The open and competitive markets combined with the push for inclusive policy bode well for the continued uptake of mobile broadband. In “Measuring the Information Society 2011” the ITU points out that 1GB of data is frequently cheaper over the mobile network, as opposed to a fixed broadband connection. “Mobile-broadband users get more for their money, since the entry-level mobile broadband (theoretical) speeds are much higher than those for fixed broadband,” (ITU, 2011). As the mobile broadband market continues to develop and infrastructure develops, prices are expected to fall even further. Mobile phones are simply more accessible than computers as well as friendlier to the illiterate. Pay-as-you go airtime models and low-cost handsets make the mobile phone the affordable option. Irregular incomes and limited access to savings tools made it difficult to save up for a personal computer or laptop. Mobile phones require much less electricity compared to a laptop or other personal computer: this is a significant factor in a continent where 587 million people do not have access to electricity. Due to the obvious accessibility in emerging markets, Gartner predicts that mobile web will be bigger than desktop web browsing by 2013 (Hoehler and McHenry, 2012). Already showing speedy growth, mobile broadband has the potential to bring broadband services to millions of Africans who would not have access otherwise. With the continued investment in infrastructure, competitive markets, and falling prices, we’re optimistic that mobile broadband will continue to change the digital divide in Africa. Check back soon for our follow up post: an in-depth look at the Digital Divide in Kenya and how mobile is changing it. Hoeler, Jon and Andrew McHenry. Insights into Mobile Telecoms in Africa. December 2011. 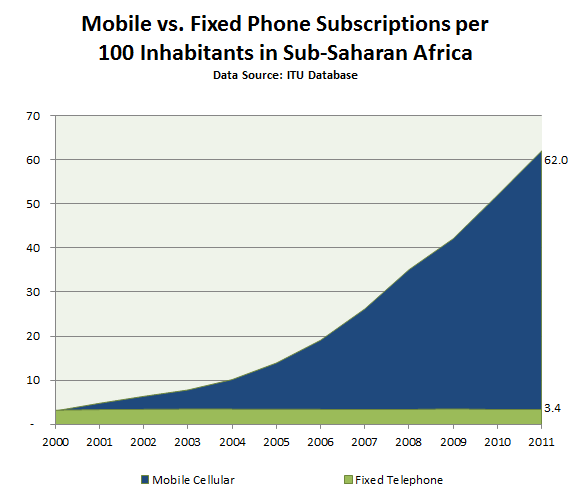 <http://www.slideshare.net/jonhoehler/insights-into-mobile-telecoms-in-africa-by-jonhoehler-andrewmchenry >. ITU. Internet World Stats. 2000-2011. <http://www.internetworldstats.com/stats.htm>. Phillip, Tom, Peter Lyons, Mark Page, Laurent Viviez, Maria Molina, Tim Ensor. African Mobile Observatory Report 2011. GSMA. 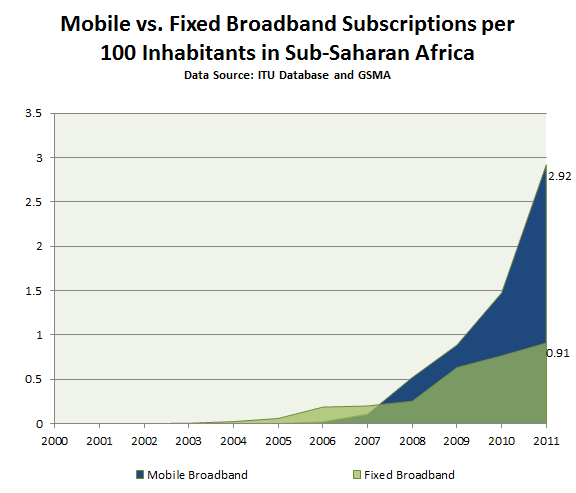 <http://www.gsma.com/publicpolicy/wp-content/uploads/2012/04/africamobileobservatory2011-1.pdf>.